When you hear IBM® Tivoli® Storage Manager, the first thing that you typically think of is data backup. Tivoli Storage Manager is the premier storage management solution for mixed platform environments. Businesses face a tidal wave of information and data that seems to increase daily. The ability to successfully and efficiently manage information and data has become imperative. The Tivoli Storage Manager family of products helps businesses successfully gain better control and efficiently manage the information tidal wave through significant enhancements in multiple facets of data protection. Tivoli Storage Manager is a highly scalable and available data protection solution. It takes data protection scalability to the next level with a relational database, which is based on IBM DB2® technology. Greater availability is delivered through enhancements such as online, automated database reorganization. 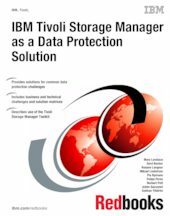 This IBM Redbooks® publication describes the evolving set of data-protection challenges and how capabilities in Tivoli Storage Manager can best be used to address those challenges. This book is more than merely a description of new and changed functions in Tivoli Storage Manager; it is a guide to use for your overall data protection solution.